In today's podcast, Pilar talks to Matt Rogish, CEO of Reactive Opps, the consulting arm of RailsMachine. We talk about how he works with a distributed team and we chat about Results Only Work Environment (ROWE). 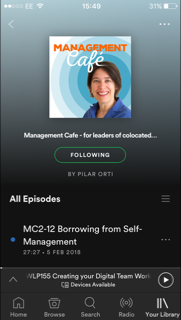 00:30 Pilar talks about the episode of Podcasters Roundtable on she took part in, on Co-hosting and the parallels with co-hosting a podcast and other collaboration ventures. Most companies are now distributed in practice. 11:55 Pilar talks to Matt Rogish, who explains what his company does: "High touch outsource" - breaking down the barriers between the team and their clients. My job as CEO is mainly to support the team. 21:05 Matt talks about how his team works. T-shaped people. 23:30 Ruby on Rails. Pilar was curious to learn more about what this. 28:00 Creating the right work environment. How Matt is creating this for his team. 32:40 "Hiring the best people wherever they happen to be and building systems that facilitate efficient communications.Results Only Work Environment. ROWE. "Managing by side-effect" as opposed to focusing on results, which is not always easy. 42:45 Pilar and Matt talk about what could have been behind Best Buy ditching ROWE, which evolved in that company. "Everything around you that you call life, was built by people who are no smarter than you". Steve Jobs. 47:20 Why Matt does public speaking and what he speaks about.